Snowmobile Parts AND where to get them! Find someone to ride with! MEDINA, MN (Dec 1, 2004) – For riders who like to split their time between trail riding and off-trail exploration, the versatile new 2005 900 SwitchBack is the ideal freedom machine. 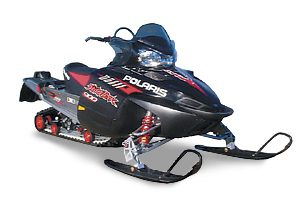 It delivers an outstanding ride, easy and responsive handling and the flotation characteristics of a deep snow snowmobile. The 900 SwitchBack touts the all-new IQ control arm front suspension featuring a patent pending and Polaris exclusive variable caster design. To the rear, a 144” track stretches out over the bumps and provides an aggressive footprint that optimizes the hard hitting acceleration of the 900 Liberty engine with Cleanfire™ Injection. Outfitted with the highly adaptable Rider Select™ steering system, the 900 SwitchBack adapts to the rider, not the other way around. It enhances a rider’s ability because the rider can adjust the handlebars to get into the ideal riding position – from the seated “Comfort” mode to a forward positioned “Control” ride zone to the stand-up “Attack” position – Rider Select™ not only adapts to different rider types and riding styles but to the terrain as well. And because of this sled’s dual personality, Rider Select™ dramatically enhances both on trail and off trail traits, allowing riders to significantly affect vehicle handling traits, weight transfer and deep snow mobility – all with a simple push of a button. Features like these make the 2005 900 SwitchBack the most versatile, best-riding and most comfortable model in its class. The 900 SwitchBack is built on the Polaris IQ chassis, which has been engineered to dramatically centralize vehicle mass giving the sled outstanding balance, great handling and a smooth ride. A great ride is directly related to a great rear suspension and the new 900 Switchback delivers. This uncoupled, dual-angle rail version of an RMK suspension offers the ideal combination of long-track ride quality and short-track trail performance. And thanks its unique dual-angle rail, the 144” rear skids can carve up groomed trails like a short track performance sled and still deliver unmatched deep snow performance. The 900 SwitchBack’s IQ front suspension is easily the best in its class and has been labeled by industry press as the best front suspension in the industry in only its first year of production. It is a key element in the sled’s great ride, especially in rough terrain, where it minimizes handlebar feedback while maintaining confidence-inspiring stability. The front suspension features a wide, 42.5” ski stance and new geometry mirrored by the 2005 Fusion, resulting in a tighter turning radius and enhanced front-end aesthetics. The Liberty 900 engine is powerful, efficient and has a broad power band that will serve SwitchBack riders whether they’re carving on a groomed trail or climbing through deep powder snow. The long-stroke 900 twin uses a batteryless injection system with dual injectors dubbed Cleanfire Injection™. It delivers easy, no-choke starts, stunning throttle response, automatic calibration as elevation and atmospheric conditions change, clean power delivery and impressive fuel economy. But best of all the new 900 Liberty twin produces a broad, thick powerband of torque, the type of power which will slingshot the 900 Switchback from corner to corner on the trails and conquer the deep snow off. The belly pan and tunnel are designed to promote excellent flotation, the front end is designed to let the SwitchBack get up on top of the deep snow quickly and the tunnel rises toward the tail of the sled to reduce drag. Plus, the front suspension has a clean, efficient design to minimize drag and deter unwanted snow build-up. The 144” track has 1.25” lugs, which gives the SwitchBack great traction in deep snow and an aggressive bite on the hard pack of a trail. The 2005 900 Switchback will be available in very limited quantities, and interested customers should visit their dealer for more details. Click here to view specifications. In order to be able to post messages on the Snowmobile Forum: Your #1 Snowmobile Forum forums, you must first register. 6 Attachment(s) 01 xc 700 rebuild ..
5 Attachment(s) Still have snow?